In Bangladesh, where arsenic highly contaminates the drinking water of at least 57 million people, according to the World Health Organization, researchers have been diligently working to figure out not only how to provide people with safe drinking water, but also just how that water has become so contaminated. Scientists have long suspected that the arsenic occurs naturally in the aquifers in which people drill their wells, but new research is indicating that instead, the arsenic might be in the soils above the aquifers, leaching down into the aquifers following seasonal rains. 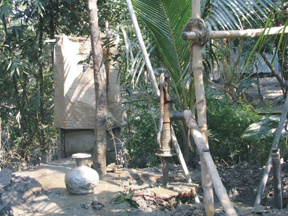 In Bangladesh, some researchers have suggested that wells, such as this hand-pump well in the foreground, drilled into aquifers below 100 meters should provide some protection from natural arsenic contamination, but new work is revealing that such wells may still be at risk in the long term. Image courtesy of Alexander van Geen. The arsenic contaminating the Bang-ladesh water is naturally occurring  it has leached out of the Himalayas over millions of years and is carried into the lowlands by rivers. The prevailing hypothesis has been that microbes in the aquifer sediments at depth liberate the arsenic from iron oxides, thus releasing arsenic into the water, says Charles Harvey of MIT in Cambridge, Mass. But when the researchers tested the aquifer sediments for iron oxides, they found little to none, Harvey says, which was a surprise. The question then became how the arsenic  which we all agree is coming out of iron oxides  could be mobilized from the aquifer sediments, when there are no iron oxides in the aquifer, he says. As reported in the Dec. 12 online edition of the Proceedings of the National Academy of Sciences, Harvey and colleagues calculated that at their field site, solid arsenic concentrations are highest in the upper 3 meters of soil, and lower in the underlying sandy aquifers, where dissolved arsenic eventually falls to safe concentrations. If arsenic were released in the aquifers, we would expect to see arsenic in significant quantities at depth, says Matthew Polizzotto of Stanford University in Palo Alto, Calif., lead author on the paper. But from the decrease in arsenic levels at depth, they surmised that the arsenic must be continuously brought in from somewhere else [at the surface] and transported [downward] through the sediments, he says. Furthermore, geochemical, rather than microbial, activity appears to be the primary suspect for the breakdown. Looking at the hydrology of the area  a large floodplain where three major river systems that flood seasonally come together en route to the Bay of Bengal  the researchers suggest that the rivers that drain the mountains are still bringing in the arsenic and depositing it throughout the region during annual floods, Harvey says. During the dry period, the arsenic would be drawn down to the aquifer, thus replenishing the aquifers arsenic levels, he says. The most pressing dilemma facing researchers is how to get clean, safe drinking water to the residents of Bangladesh. Van Geen and colleagues have suggested that drilling to deeper aquifers below 100 meters seems to be the safest option for now, as the deeper the aquifer, the lower the arsenic concentration appears to be, van Geen says. So this paper may be of little consequence, in terms of the sustainability of drawing water for human consumption from deeper aquifers that are presently low in arsenic for another 10 to 20 years. On the other hand, he says, if Polizzottos teams hypothesis also turns out to be supported by direct evidence, then deeper aquifers presently low in arsenic may be affected much sooner. Our research doesnt affect the contention that deep aquifers are safe, Harvey says. Deep wells still appear to be a good solution. However, Polizzotto adds, there are definitely still many questions to answer about how arsenic moves through the system.